Winslow, Arizona police officer Austin Shipley (pictured) wears a t-shirt from the Three Percenters, a well-known white supremacist paramilitary group. Shipley murdered Navajo mother Loreal Tsingine, 27, on March 27, 2016. This Friday, July 29 in Winslow, Arizona, family and community members and the Border Town Justice Coalition are marching to demand that Austin Shipley be arrested and prosecuted for the murder of Loreal Tsingine and an independent investigation be conducted into the circumstances of her murder and the racial profiling and harassment of Natives by law enforcement. 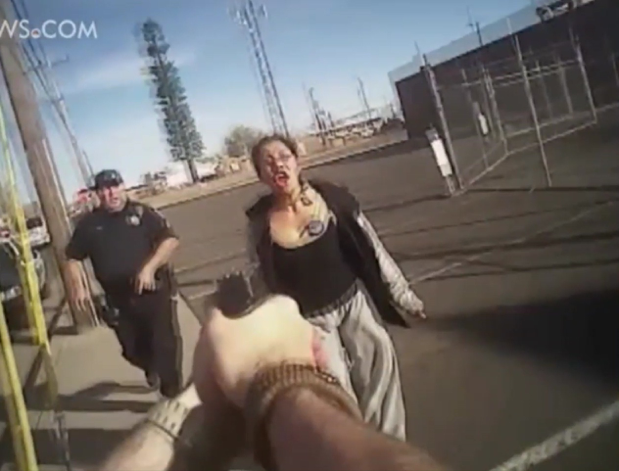 Yesterday afternoon the Winslow Police Department released body camera footage of Officer Austin Shipley brutally attacking and killing 27-year-old Navajo mother Loreal Tsingine. The footage shows Shipley jumping out of his vehicle and rushing Tsingine as she is walking away from him and another officer. When Shipley encounters Tsingine she is walking away in the opposite direction with her back toward him. She did nothing wrong, but was accused of shoplifting less than $30 worth of cheap goods from a nearby Circle K. There is still no proof of this and the officers didn’t witness it themselves. It was an accusation from a store clerk that Shipley and the other officer didn’t verify. Shipley sees Loreal, barks an order at her, circles her like a shark, and then immediately tries to arrest her for crimes that are not made known to her. Shipley throws her to the ground. Remember, Tsingine isn’t convicted of any crime. There was no reason to attack her. She was not threatening Shipley in any way when he threw her to the ground. At this point Tsingine responded to the aggression. Shipley physically attacked and humiliated her. She pulls out a small toenail scissors to defend herself against a physically larger and lethally armed Shipley. Shipley’s record shows that he has violently attacked people with lethal force several times previously. According to his personnel file, Shipley used a Taser on a 15-year-old girl who also turned her back on him and simply walked away. 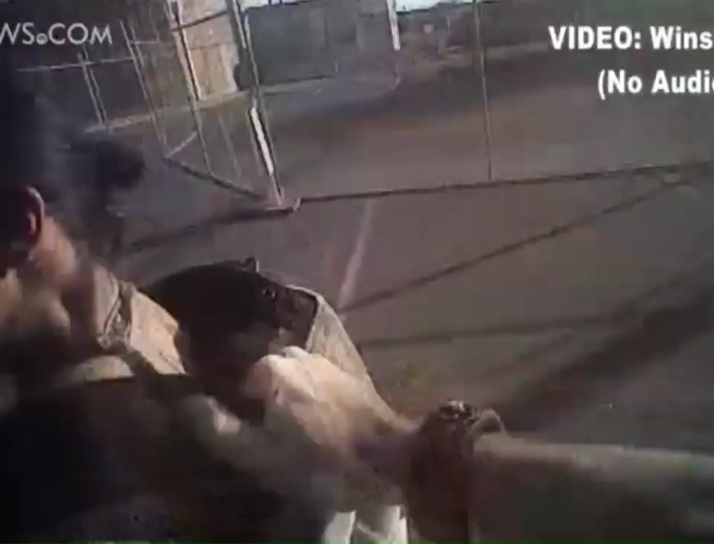 Previously released footage also showed Shipley punching an intoxicated man in the face when he “passively refused” to follow Shipley’s commands. Tsingine had no knowledge Shipley was homicidal. At this point he throws her to the ground. 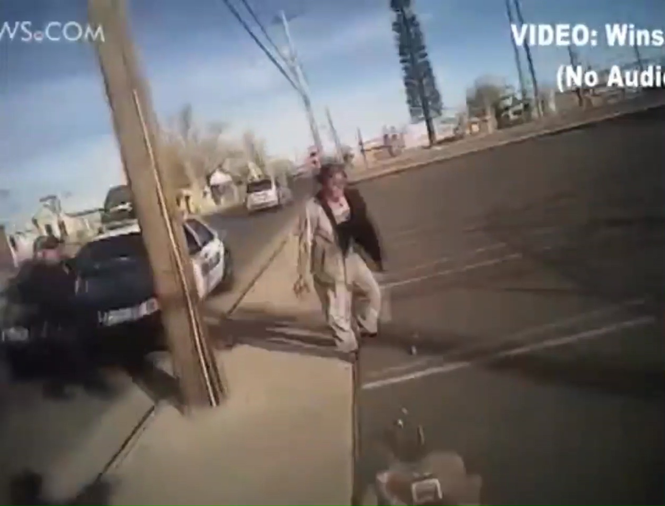 Although the video released to the media ends before Shipley fires five fatal shots, sources say Tsingine was shot twice in the chest, once in the hand, and twice in the back. It’s unclear in which order. What is clear is that Shipley is an aggressive, murderous, white man with the impunity to kill, and he never hesitates to use lethal force. When Shipley assaulted Tsingine, he uses his bare hands to beat and throw a one-hundred-pound Navajo mother to the ground. He uses a standard issue police pistol to execute her at point blank range. All the tactics and weapons — fists and gun — Shipley deploys are legal and standard policing practices — making any Native woman, or any person, a potential target for state sanctioned murder. His lapel camera, which is supposed to deter this kind of violation, captured his homicidal actions. 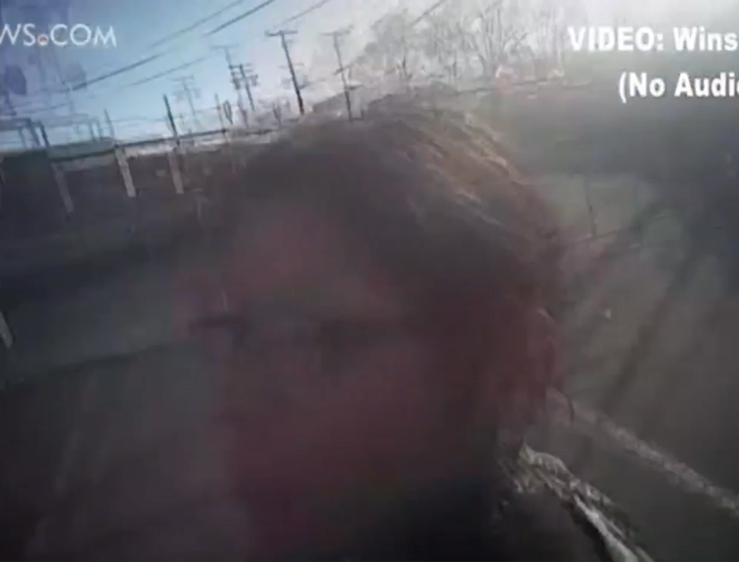 The camera had zero impact on Shipley’s violent behavior and his decision to shoot Tsingine. He clearly felt he had license to inflict murderous terror upon a Native woman. Austin Shipley justified killing Tsingine because she had a scissors in her right hand. The video shows that it was an angled toenail scissors with a blade less than an inch long. Tsingine pulls this out and Shipley grabs her by the right arm with his left arm. Shipley shoves Tsingine to the ground and immediately draws his gun. Tsingine catches her fall. She is upset. Her prescription pills are spilled all over the ground. A second officer approaches Tsingine at this point. He is noticeably much closer, but doesn’t have his weapon drawn. The video shows Tsingine recover from her fall. Her purse swings from her wrist. Her scissors are dropped. She is approaching Shipley angry, but not violently with hands down and to her side. She is staring him down and he is uncomfortable. Shipley has his weapon drawn. 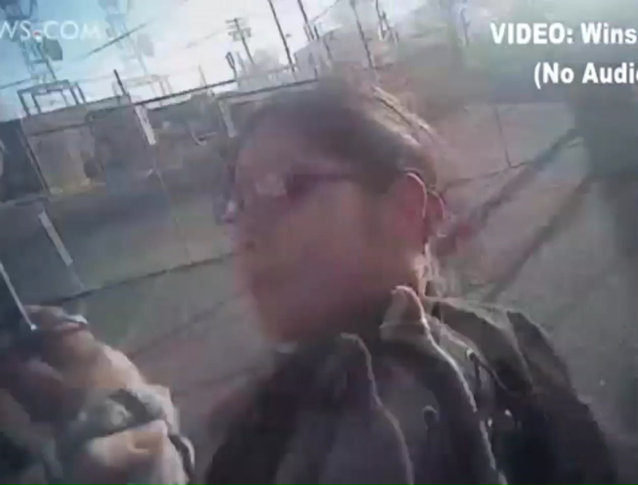 The second officer is about to assist Shipley rushing her from behind — probably like other physically violent and humiliating arrests she’s endured as a Native woman in a racist border town like Winslow. Maricopa County Attorney Bill Montgomery announced his office found that Shipely committed no crime. Shipley is free and on paid leave. Based upon the evidence, it is our perspective that Austin Shipley, the aggressor and transgressor against a Native woman’s body, unjustly murdered Loreal Tsingine in the name of the law. Rather than seeing Tsingine’s defiance as noncompliance and therefore an act of guilt or that she deserved death, we view her defiance as an act of self-defense against a homicidal, misogynistic white man with a badge violating the sanctity of a Native woman’s body. Loreal Tsingine’s act of self-defense was not just against a racist white cop, but against a racist system that kills and violates Native women with impunity. As a cop Shipley is charged with upholding the boundaries of the law. As Tsingine’s actions demonstrate, he violated those boundaries acting as the trespasser and aggressor and not a protector. With the full weight of the state at his disposal, he abused his position of authority to violate and murder a Native woman. Shipley is a racist murderer and criminal with a long track record of deceit, abuse, violence, and aggression. If he is not prosecuted and held accountable for his crimes, he will surely violate and kill again. Video: Shipley walking around Tsingine, who is motionless, before he grabs her, jerk her around, and attempts to arrest her. Video: Shipley grabbing Tsingine by the hoodie and throwing her to the ground. Video: Shipley throwing Tsingine to the ground for the first time. Video: After being thrown to the ground Shipley continues to jerk Tsingine around by the neck from behind. Video: Although Tsingine has scissors in her hand you can clearly see Austin Shipley has her hand under control. He pushes her away and draws his gun. 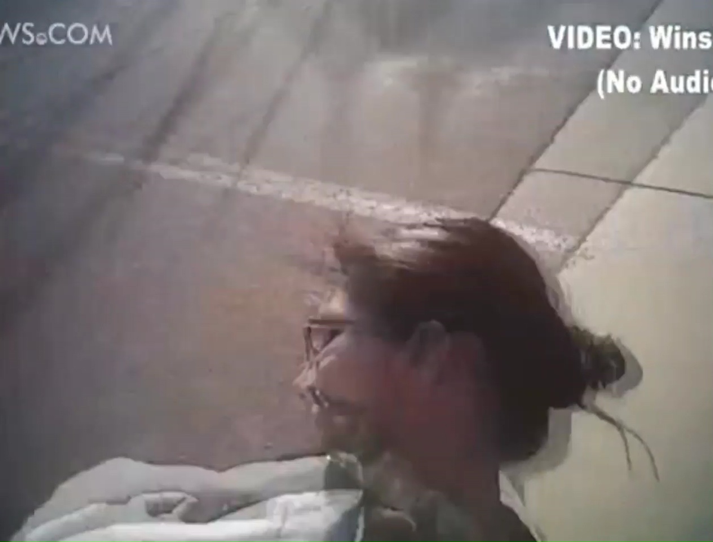 Video: Tsingine thrown to the pavement with the contents of her bag spilled onto the ground. It appears as though Tsingine had none of the items she was accused of shoplifting on her. Video: Shipley draws his weapon as soon as she stands to gather her things. Video: Tsingine approaches Shipley at an even pace. She clearly doesn’t have any of the alleged stolen goods and her scissors are not visible in the picture. You can only make out her left hand and her right hand is holding her purse. She doesn’t appear to know Shipley has his gun drawn. As you can see, the second office is moments away from assisting Shipley. Video: Still a half dozen feet away, Officer Austin Shipley draws his weapon and kills Loreal Tsingine. She appears to yell at him. Perhaps she noticed the weapon for the first time and is trying to convince him not to shoot her. Maybe she is yelling in protest for being physically assaulted. We cannot know because the audio in the video that was released is not available until after Tsingine is gunned down.